Arianespace successfully launched its Ariane 5 rocket on Feb. 5 at 6:01 pm (local time) from the Guiana Space Center, Europe’s spaceport in French Guiana. This was Arianespace’s first launch of the year and the 103rd Ariane 5 mission, bringing the number of Geostationary Orbit (GEO) satellites launched by Arianespace to 374. 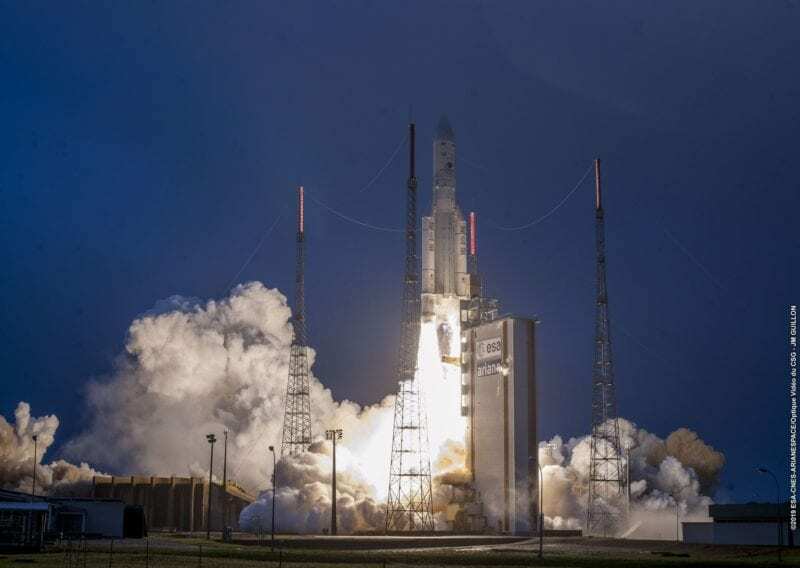 Arianespace successfully orbited two telecommunications satellites — the Saudi Geostationary Satellite 1/Hellas Sat 4 condosat for operators KACST and Hellas Sat; and GSAT-31 for the Indian Space Research Organization (ISRO). “This year we kick off the 40th anniversary celebration of the first launch of Europe’s Ariane rocket with a successful launch of Ariane 5. Through this emblematic flight, Arianespace underscores the reliability of our heavy launcher, the benchmark in the launch segment for geostationary telecommunications satellites. By carrying out a mission for long-lasting customers from three continents – Arabsat, KACST, Hellas Sat and ISRO – we continue to prove the attractiveness of Arianespace’s launch services for customers from around the world, both institutional and commercial,” said Stéphane Israël, Chief Executive Officer of Arianespace. The post Arianespace Successfully Launches 2 Telecom Satellites appeared first on Via Satellite.